Before all this started, I was just me. A fairly shy, relatively private person. Not much self-confidence but passionate about what I believe in and an innate desire to help others. Writing in the past was little more than things like shopping lists! A lot has changed in the last 5 months. My mind was buzzing yet I just felt completely drained. ‘Chaotic emptiness’ was the phrase I used then. I couldn’t cope with it. I wanted to get away from feeling like this; leading to some very frightening thoughts that I had to work very hard to control. I mainly stayed curled up in a ball in bed, not eating, not drinking, not speaking. Just wanting the world to go away. Trying to stop my mind from tormenting me, but being unable to switch it off; unable to trust myself if I moved from that spot. After a couple of days, I found myself reaching for my little laptop. I started typing; the result was ‘The Other Side‘ and the ‘GP and Human’ blog and website was born. I don’t remember writing it. I don’t recognise it as coming from me when I read it now. I’m told it is powerful and well-written; but I don’t see that. It has been widely shared online since. I think, when I wrote it, I just wanted patients to understand better how it is for us; I was so frustrated and demoralised by all the grumbles directed at us when I know we are trying our best in a broken system that we have no power to fix. Apparently, it was actually well-received by colleagues, especially those who are also struggling; it resonated with them. 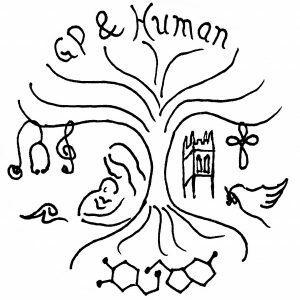 I don’t remember consciously creating the title of ‘GP and Human’ either; I suppose the fact that we are humans with our own lives and emotions as well as being doctors was a crucial part of how I was feeling and being a ‘normal’ person is what I am particularly known for at work. Writing helped; I had put some order to the chaos in my head by writing it down. I did it again; the next blog materialised. Then another; I kept going. This somehow was acting like a form of therapy for me. At the times when I became increasingly restless, there was a compulsion to write; I just had to do it before I could regain any sense of calm at all, whether that was day or night. I was still not talking generally; I shut out my husband, mum and best friend. The only way I felt I could express myself was through the writing. The only way they knew how I was feeling was through the blogs. I hated myself for it, but I couldn’t help it. Since then, I have continued to chart this ‘journey’ (that always sounds so clichéd!). The instinctive desire to do so diminished quite a lot as I started to recover and I wrote less frequently. But, it was still helping me to manage my emotions. I have had lovely feedback from other people thanking me for being so open; apparently, it has helped others in a similar position to feel less alone and it has helped relatives and friends of people suffering to understand better. Hearing this made me even more driven to continue; helping others is such a huge part of who I am and it gave me a sense of satisfaction and self-worth again. It also gave me a sense of purpose and I almost started to feel like I had a responsibility to see it through (whilst being careful to make sure it didn’t become an additional burden). It also feels like I am doing my bit for getting people talking about mental health and trying to reduce the stigma that unfortunately still lives on. Things have evolved over time. As well as the blogs about my recovery, there are now social media pages with day to day things posted and blogs about other topics. As I said in my last blog, (‘What does ‘Depression’ look like? – from the outside…‘) I have several reasons for this. Some of it is because I feel I have achieved something (often a small task but can feel like a huge goal attained) and positive feedback helps affirm it in my mind and aids further recovery. Sometimes it is because I think it might be helpful or give pleasure to others. Finally, there are topics that generate clear views for me that I feel compelled to write about with the hope that I can ‘make a difference,’ even in just a small way! The GP Health Service was a revelation that I will be forever grateful for (I was unaware of it before I needed it!). However, there is fairly little out there for general day to day support in these tough time for doctors, especially peer to peer. I have developed online (Facebook-based) psychological support groups for GPs and other Physicians as well as a GP Wellbeing group to share general strategies for wellbeing. I hope I have helped to fill a gap by creating and running these groups. Although completely unexpected, I also find myself taking more of an interest in general wellbeing (particularly in clinicians) and ‘lifestyle medicine,’ which had never crossed my mind 6 months ago. I feel I have also formed new friendships, albeit only online so far, through the communications that have taken place with others in a similar position and those with interests in these areas. Maybe there could even be a future involving more writing; not that anything since the first blog has been much to speak of! I have been approached by a couple of online GP communities requesting me to write for them, but have not yet decided how and when I might take these up; especially around the question of whether I remain anonymous or not or vary this by context. As well as the online groups, I am now looking into establishing a Gloucestershire GP/Physician Social, Wellbeing and CPD Group for ‘real life’ interaction and support. General Practice can feel quite isolating at times in a strange sort of way and it can be hard to find opportunities to mix with colleagues to debrief from tough situations, discuss clinical scenarios and simply enjoy some company socially. Cake is likely to be involved! I have chosen now to write this summary of ‘GP and Human’ so far, partly because the return to work is the most significant ‘landmark’ to date and also because relevant dates have coincidentally fallen in an interesting way. My first day back seeing patients will be February 14th; exactly 5 months since the last time. I will have a better insight into mental health as a doctor and I hope that will enable me to understand patients’ perspectives more clearly and therefore guide them more effectively than before. I will continue to enable clinicians to support each other through the support networks I have developed so far and the new local ‘face-to-face’ one I am hoping to establish soon. As alluded to, it may even open doors to other things in my future career; writing, wellbeing/lifestyle medicine, possibly even working for the GP Healthcare service myself. Who knows? I am not ready yet and there is no rush. But none of it would have been on the radar if I hadn’t gone through this.